The old man from the picture. The various formations he made for fun in the past. Out of those formations, Cao Cao managed to get a glimpse of the Eight Gates Restraining Formation, and used it as a military formation. When he claimed that he made the formation on his own, the old man just smiled. And when people started saying that Cao Cao was the one who created the formation, the old man pretended to not know about it. Who created the formation didn’t really matter to him. He actually gave some credit to Cao Cao for being able to use it so perfectly like that. But the formation that Cho Ryu Hyang showed to Jo Gi Chun just now was incomplete in many ways. The old man was able to figure that out the instant he saw it. To think that this boy, who knew quite a bit about formations, would do this. It wasn’t just that. The boy fixed the holes in his formation with his own ways, and made it complete. It didn’t seem possible for a young boy like this. Even though the old man made this on a whim, this formation had some profound mysteries contained within it. If a person was unable to find this out, the person would be unable to live in such a place. The old man was already excited to see how Cho Ryu Hyang would overcome this. Unlike the old man, who was overflowing with relaxedness, Cho Ryu Hyang at the moment was completely bewildered. Suppressing his scream inside himself, he trying to gain his surroundings. Right then, the ground flew up right in front of his eyes, and became a wall of stone. 3 more flew up, and completely sealed Cho Ryu Hyang inside. This formation started off with sealing a person from the outside world completely. Right now, the space Cho Ryu Hyang was given was only about 1 pyeong. Cho Ryu Hyang gave up on asking for help, and quickly looked around. He was trying to find a way to survive. While doing so, he stretched his hand out towards the wall. He wanted to see if the wall in front of him was real or not. He could feel the hardness of the stone wall. Forgetting the fact that he was in grave danger, Cho Ryu Hyang shouted in admiration. This was a formless illusion. It had to be. For the illusion to feel “real” even though he was aware of what it was… was this not surprising? He never thought such a strange thing was even possible, from the time he was born. Logically, this was impossible. But the impossible was happening right before his eyes. It was his own creation, too. At that thought, Cho Ryu Hyang felt a bit proud, and desperate at the same time. He made the formation so perfect, he couldn’t find a way to get out. Cho Ryu Hyang, who was hitting at the stone walls, thought a bit. According to his calculations, once the formation trapped someone inside, after 15 minutes, the first transformation would take place. Before that happened, Cho Ryu Hyang would have to come up with a way to escape. If he calculated correctly, he wouldn’t even survive the first level of the eight total transformations. And if he died here, he’d have died a stupid death. The nucleus of the formation was there, where the greatest changes would take place in. After calculating for a moment, Cho Ryu Hyang scratched his head. According to the results, the effect of the transformation would be unbearably strong. The 4 beasts that represented the 4 directions. The formation was being decrypted based on the beasts. The Azure Dragon, White Tiger, Pheonix, and the Black Tortoise. The first of the 4 beasts would be the water god (水神) of the north. The Black Tortoise’s harmony meant that a great wave was going to appear soon. The problem was, he didn’t know how to deal with it, even if he knew it. For normal formations experts, this was a rather puzzling situation. When you knew how to make and activate a formation, naturally you would also know how to destroy it. If an expert of Cho Ryu Hyang’s caliber got trapped in the formation, then he/she would be able to break through in less than 15 minutes. That was because the formations experts learned about formations not by mathematics, but by the movements of the world. But unfortunately, Cho Ryu Hyang wasn’t a formations expert. He never really learned about formations in the first place. The only thing he knew about was math. Relying only on math, he was trying to break through the formation. Naturally, this would be hard. The more he thought, the more he realized how much trouble he was in. In order to get out alive, he kept thinking. And while he struggled like so, death quickly approached him. All of the sudden, a feeling of desolation fell upon him. Cho Ryu Hyang swallowed his spit out of nervousness. The air started to vibrate. It was about to happen now. When Cho Ryu Hyang looked at the top with difficulty, he could make out the newly-formed cliff starting to crumble. The sight blocked by the cliff. The slight smell that tickled his nose. Cho Ryu Hyang laughed without knowing it. This was so inconceivable, he just started laughing. Once he saw what was above the cliff, that word came to mind. He saw a sea that seemed to never end. The sea that seemed to be able to touch the sky, to boot. The berserk winds proved just how strong the waves were. A giant tsunami was rapidly approaching Cho Ryu Hyang. Cho Ryu Hyang’s eyes shined as he fixed his glasses. There should be a safe location somewhere. This wasn’t a simple prediction or anything. In a formation, there existed a door of life (生門), and the door of death (死門). Since Cho Ryu Hyang didn’t officially learn formations, this was all he knew, but this was enough. Cho Ryu Hyang started to slowly fumbled around the floor as he solved equations in his head. There were a total of 8 variables in the formation. Since one of the variables activated, that one variable should be safe out of the other seven. The problem was, he didn’t know where that was. But Cho Ryu Hyang didn’t give up. He was currently standing on an island. An island that was only about 1 pyeong. It was surrounded by water on all sides, and on that island, was Cho Ryu Hyang, who was frantically searching for something. As the island was small, Cho Ryu Hyang found what he was looking for quickly. But he hesitated for a moment. A stone small enough to fit a small child. Looking at the wide, flat stone that exudes an aura different from other stones, Cho Ryu Hyang thought a bit. The stone represented “5” according to his calculation. Out of the 8 vertexes in the formation, it represented the South. The opposite of the Water God’s position. Cho Ryu Hyang had to make a choice sooner or later. The situation was quite dire right now. One wrong choice meant death. Cho Ryu Hyang adjusted his glasses’ position with a trembling hand, and made a bitter smile. If you think logically, since the Water God represented the North, it would make sense to go into the Northern vertex. But then, a feeling of suspicion quickly rose up, and changed Cho Ryu Hyang’s mind. When he looked back at the activation of the formation, the formation required a tremendous amount of equations to be solved. There were variables involved, too. It was too complicated. So complicated, it felt like his head could explode. It wasn’t possible for a solution to come out easily like that. A feeling of rejection rose up. And the conclusion he reached was this. But he had no confidence. Was his first answer right? Or was his second answer right? 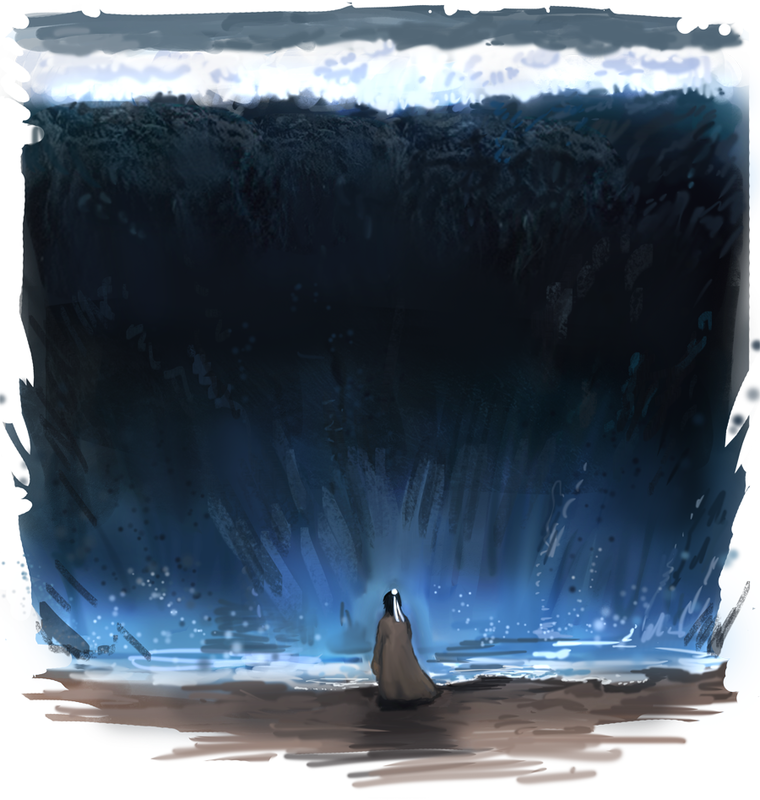 Looking at the giant tsunami that was right in front of him, Cho Ryu Hyang chuckled. He could see the white foam on the tsunami now. He had to make his choice. In mathematics, probabilities were the most unstable way of solving equations. That was why Cho Ryu Hyang tried to not rely on it if possible. He was moving towards the answer with less probability of survival. Looking at his actions, he laughed. The suspicion that rose up before. He decided to believe in his senses. When Cho Ryu Hyang moved his body to the desired spot. Jo Gi Chun, who was currently located at the border of the formation, stroked his beard with a puzzled face. He noticed it the moment he entered the first transformation. The Eight Gates Restraining Formation. He could say he knew the most about it, as he was the one that restored the formation from the historic records. When you look at the Three Kingdoms book, there appears a figure known as “Cao Cao”. This figure was known for creating the Eight Gates Restraining formation, and use it as a military formation. It was also said that Liu Bei was the first one to get through this formation. Anyways, the normal Eight Gates Restraining Formation was a military formation made to restrain a large amount of soldiers effectively, and kill them. Jo Gi Chun simply converted that military formation, and turned it into the standard formation. The use of a military formation clearly differs from a standard formation. But the main idea of the formations aren’t that different. There were 8 profound laws in the formation. Jo Gi Chun knew that well, which was why he was waiting on the edge of the formation. If he waited there, there should be a wall that would appear soon enough. But what was this? Instead of a wall, a giant stone wall appeared in front of Jo Gi CHun. When he touched it, he was extremely surprised by how real it felt. This kind of realism couldn’t be achieved with the formation he gave the boy. This much realism was comparable to the Heaven’s Might Appearing Formation (顯靈天武大陳) that was placed in the imperial palace. Jo Gi Chun looked closely at the ground. But it wasn’t like he couldn’t get through it. Jo Gi Chun, who gave Cho Ryu Hyang this formation in the first place, knew the weakness of this formation. The weakness he put in on purpose. He made the formation weak on purpose. Since he already knew all there was to know about formations, he made it so that the formation was easy to get out of. But since he made it up on the spot, he was afraid that Cho Ryu Hyang would’ve found it and fixed it. Jo Gi Chun was looking for that small hole there. A good formation would change freely over time. A formation would only be complete if it had complete freedom in its own region, thereby creating unexpected events inside. Jo Gi Chun moved about, observing the ground. He soon came to a halt somewhere. He began counting numbers patiently. Soon, he stretched out his hand. The stone wall in front of him crumbled with a touch. An entrance was created, but Jo Gi Chun’s face wasn’t looking very well. No, it looked worse than before. The formation was at least 10 times stronger than average. Jo Gi Chun’s face went stiff. isnt it reverse? jo gi made the formation and showed it to sho ryu? Yeah, I got a little confused there, too. I think the author meant that Cho Ryu Hyang, when he got the formation from Jo Gi Chun, deliberately weakened it, and completed it in his own way. So in Jo Gi Chun’s eyes, the formation would be “incomplete”. And Jo Gi Chun gave the complete formation to Cho Ryu Hyang, but fiddled with it a little so that he could easily get in. Thanks! I say, Cho Ryu Hyang, you keep on being amazing, lol. Well, good luck on getting out of there! Why is the black tortoise a wave? The black tortoise represents earth. It isn’t the black turtle. The Black Tortoise represents water. Oops… Looks like what I read was wrong, looked into it more after this. Sorry bout that. I looked into it once and what I found was not based on the five elements but the four more modern elements. But a tortoise is a land animal regardless so it seems strange… Oh well.